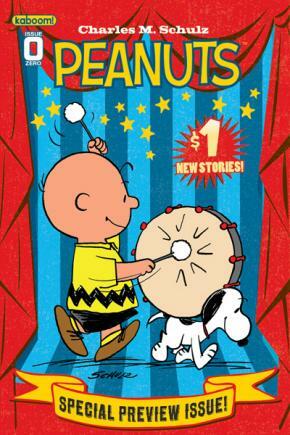 The preview issue of the new monthly Peanuts comic book series arrived in comic book stores on Wednesday, November 2. Peanuts #0 features "a new original story and supplementary material that will provide a sneak peek at the series launching in January." Visit Comic Book Resources to see a preview of some of the pages. While it's probably simplest (and cheapest) to get it from your local comic book shop, you can order the comic book from the Boom Studios website. The new series of Peanuts comic books are put together by the same team who produced the well-regarded graphic novel version of Happiness is a Warm Blanket, Charlie Brown.